And Google is making more things possible again by combining the forces of two applications. It is now possible in Picasa Web Albums to exactly pinpoint where you have taken your pictures. You can also create a kml file that allows you to show the pictures in Google Earth. 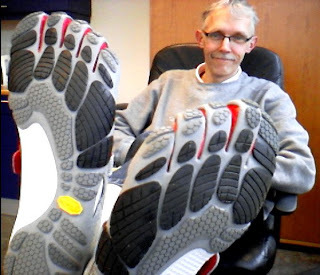 This makes Picasa Web Albums come close to Panoramio. Only difference is that anyone can now easily see the pictures uploaded to Panoramio by any user. I expect that the public photos on Picasa Web will be visible in a layer in Google Earth pretty soon. Google did buy Panoramio recently and they have a very thorough history of integrating applications. It will make looking around in Google Earth even more fun. Seeing pictures taken by neighbours of your own neighboorhood. Better than looking for a cat in Street View! 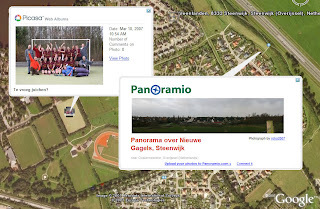 Google Maps now already shows the Panoramio pictures in the My Maps context. So things are rolling. The game's afoot! Now here's a fine example of a Panoramio picture on Google Maps. Be sure to go to the My Maps tab and select the Panoramio layer. There is panoramic view uploaded by me. Maybe just for the Dutch readers amongst my visitors I did an exam last week and passed! I now am a certified Youth Hockey Trainer! While doing a bit of an ego search on Google I discovered that this little blog post was already in the serach results. Incredible. Scrolling a bit down I found this item and when I followed through I felt my heart from joy. The names of the great Eric Meyer and me in one newsletter! Wow! I know, it's not much, but it was half an hour fiddling about. Fun! Nowadays, the world is village. Sydney is just round the corner of New York and Moscow and across the street from Baghdad and Brussels. People you have once met are always very nearby. E-mail and IM and all sorts of social sites make it easy to find about every person with some Internet past. Lately, I have been putting some spare time in collecting connections on LinkedIn and see my network growing every week. I have reconnected to people I hadn't spoken with for years. It's fun. Well, here's my public profile at LinkedIn. You never know if YOU might want to get back in touch with me. Some time ago I published the disclaimer for this blog, well because some people needed to be aware that no sheep were hurt. No dogs either. Now there are more of these disclaimer around and I stumbled into this one today. For some years now I am devoted user of the Firefox browser. I just love the myriad of extensions as a user and the web standard implementation as a developer. I just can not live without the DOM Inspector or Firebug. But I always knew that there was supposedly a better browser out there that was even better at rendering according to the standards: Safari. It tickled me and made me aware that in that area Firefox was just not the best browser. Close maybe, but not the best. And aaaaargh Safari was only available on Apple. Eventhough Apple computers have been very tempting and I have seriously thought about getting myself a Mini, I never really got round it. Now things have changed a bit: you can now download a beta version of Safari 3 that you can install on OS X or on Windows XP or Vista. I'll take a look at my blog and see how it looks in Safari! [singing]It's a beautiful day, the sun is shining I feel good, nothing 's gonna stop me now[sorry].